have a perfect ski course for Beginners. Most of all, We can reach at there only in 80mins from Seoul !! 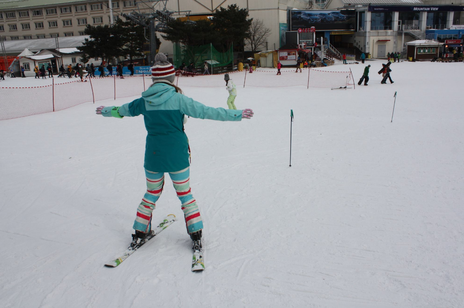 VIVALDI PARK SKI WORLD has been noted for being the most visited Ski resort in Korea for seven consecutive years. It has its state-of-the art facilities and slopes suitable for all levels and yet more facilities are newly installed every year to maintain its reputation. Only 45 minutes from Seoul, It is the closest ski resort from Seoul and largest Ski area in Seoul metropolitan region. Surely it will not only give you unforgettable memories, but also will be a perfect get away from your busy life. This World-class SKI WORLD can accommodate 20,000 visitors daily, covers combined slope area of 1,322,021m2, total slope length of 6,784m. Among a total of 10 lifts VIVALDI PARK SKI WORLD operates, there is a Asia's first 8-seater express chairlift and 8-seater gondola. Never tried? No worries just go skiing with us! After 2 hours lesson, we will get to know how you like skiing ! With funny and experienced JKN ski instructors!